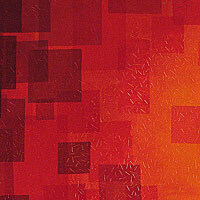 This design, inspired by a repetitive chant from the Taizé community, references both flame and dove as tangible signs of the Spirit’s coming at Pentecost. 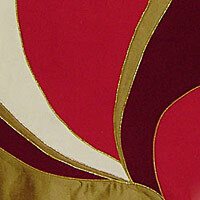 The many, many fabrics pieced into this design bear witness to the Spirit’s gifts of infinite variety and amazing diversity; the gold highlights emphasize the contributions of each person’s gifts to the life and ministry of God’s church. 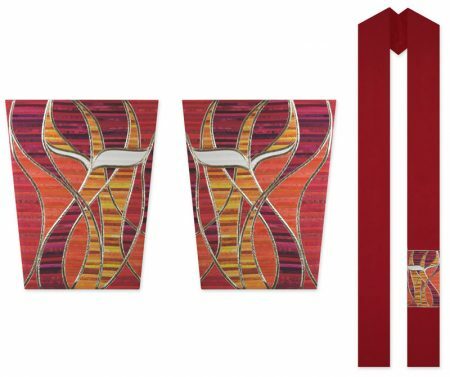 This collection is used on the Feast of Pentecost, Reformation Sunday, on days when church martyrs are remembered, and when clergy, pastors, priests, and deacons are ordained or commissioned for ministry.